With the Chinese Lunar New Year just a couple of weeks away now, most Chinese families are busy preparing all sorts of cookies and goodies to be shared with family and friends. 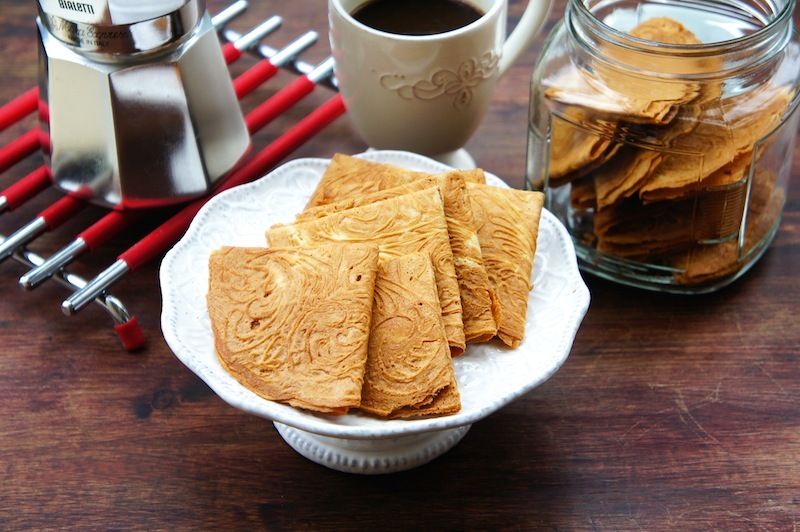 I'd like to share a couple of my favorite cookies recipes with you and I will start with this crispy, delectable, and lovely coconut fragrance cookies fondly known as Love Letters or Kuih Kapit in Malaysia. There are only five ingredients needed to whip up the batter, namely eggs, sugar, coconut milk, all-purpose flour, and rice flour. The traditional method is to use a special patterned iron mold press to cook the batter over a slow glowing charcoal fire. As I do not have access to the traditional apparatus and the weather here in Vancouver is still pretty chilly and wet, I used a KrumKake/Pizzelle maker to make these cookies instead. It works just as well, so, do try making these Love Letters using this tried and tested recipe and method. Combine the eggs and sugar in a mixing bowl, and mix well. Add the coconut milk, and stir in the flours. Strain the batter and let it rest for an hour. Preheat the KrumKake/Pizzelle maker according to the manufacturer's instructions. Set the color setting to number 3. Scoop 2 Tbsp of batter onto the mold, cover and bake until they are ready or light brown in color. Remove the biscuit and quickly fold in half, and half again and then press down lightly. Cool on the rack and store them in an airtight container.